"Your dreams may be closer to reality than you can possibly imagine." This book is sweet as churros, and possibly even more addicting. As soon as I saw that this was a retelling of You've Got Mail, I knew I had to give it a shot. Plus, we're almost in the full swing of summer, and I was dying to get my hands on a quintessential beach read. I wanted blue waters, good writing, and of course, a splash of adorable romance. Thankfully, Bennett delivered. I think there's a good chance that Alex, Approximately is going to be my favorite summer read this year. As much as I hate the saying "she's not like other girls," it really does kind of apply to Bailey. She's been through some trauma, and as a result, she has a terribly difficult time opening up to those around her... even her online best friend, Alex, whom she's never met. Porter, on the other hand, is no picnic either. Not only is this a story of falling in love with an unexpected person, but also one of healing and gaining confidence. I will admit that parts of the story come across as extremely predictable, but that is to be expected since it's a retelling of a movie many of us have seen. I mean, it says right there on the back cover that Alex and Porter are one and the same, so we spend much of the novel just waiting for the big reveal. I can't decide if I liked knowing the whole time or if it would have been fun to be in the dark like Bailey. My guess is that if Bennett had gone with the latter, I would have viewed the book as even more predictable than I already did. A couple of other things I really appreciated about this recently published summer gem: Bailey's parents are actually present (or at least her dad is), and she actually works to have a relationship with them despite the chaos occurring in her own life. Also, Bailey is relatable in a way that doesn't make me roll my eyes. Most teenage girls aren't obsessed with classic movies or vintage clothes, and yet Bailey still seems down to earth. Also, Porter. Dang, that boy will have you giggling as you read this book by the pool. Which I do highly suggest, by the way, because Bennett's descriptions of beach-town life will have you dying to sink your toes in the sand and feel the salt breeze on your face. 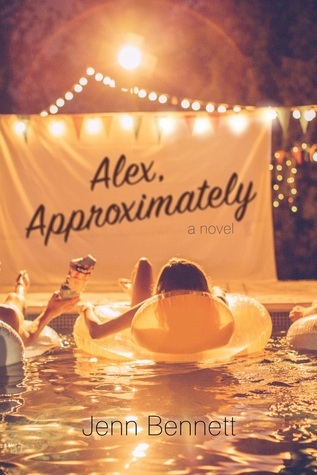 I've been looking forward to the publication of Alex, Approximately for months, and I'm so glad to say that it met (if not exceeded) all expectations. Sure, it's not going to win any awards for originality, but it's well-written, fun, and most importantly, downright enjoyable. Definitely check this one out if you're (A) in the need for an Anna and the French Kiss type romance or (B) searching for the perfect travel companion for your next sunny getaway.